Let’s start at the top, in the mountains. The Pyrenees (Catalan Pireneus) form a natural border between Spain and France. There are three main ranges in the Pyrenees, the highest of which is the central range on the Spanish side, called the Pico de Aneto at 11,168 feet / 3,404 meters. This mountain range is older than the Alps and abundant in timber and farming. With rivers and waterfalls, forests, cliffs and ancient villages, it is a trekkers paradise. There are many day trips available to the Pyrenees from Barcelona. One example itinerary would be to pay a visit to the small ancient village of Vic, pick up some picnic supplies and then travel on to the Vall de Nuria, a magnificent glacier valley. The history of this range is so interesting too, and we want to mention that on the French side of the Pyrenees is Lourdes. Now to the Sea! About an hour and a half from Barcelona is the Costa Brava region. The name translates to Wild Coast, and that it is. Travelling to this area is also easy to do. There are trains and buses, day trips out of Barcelona an of course you can hire a car. Here there are many lovely little coastal towns, as well as more developed area’s geared towards tourists. Whichever you like, the water and the beaches are beautiful. The Costa Brava includes the towns such as Cadaqués, where Salvador Dali lived, and L’Estartit where Princess Diana was rumoured to have bought property. Sa Tuna and Cala del Pi are idyllic spots with golden sand and crystal waters. Cap de Creus is also lovely to visit and was a source of inspiration for Dali. Here you will find of rock pools and natural beauty. Families will also like Tamariu. 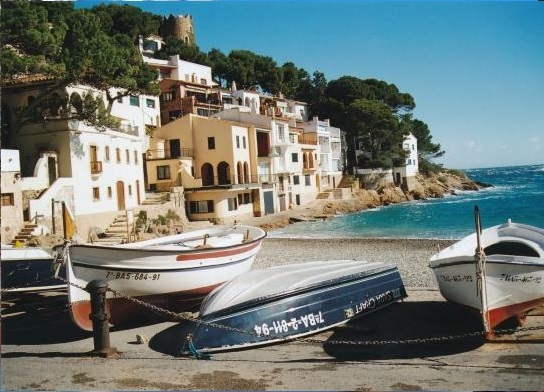 Whether you can just spare the day or have a few days, the Costa Brava is a largely unspoiled coastal area of the Mediterranean and makes a wonderful day trip from Barcelona!